Press OffRoad 10/2015 - Seikel 4x4 Technik (Pty) Ltd. Precisely because this Amarok from SEIKEL is a prototype and not a standard production vehicle, the journalists at OffRoad were interested in taking a closer look and examining the complexities of the lift kit from SEIKEL. SEIKEL shows that impressive ground clearance cannot be achieved by outsize tyres alone with its three-stage conversion concept: in addition to the suspension lift kit developed specially for Amarok, there is a specially developed portal axle and chunky tyres in 285/70 R17. The necessary wheel rims were actually developed by SEIKEL for the T5 Extreme, but they are also the ideal choice for the Amarok Extreme. To protect them from damage from below, the engine, gearbox and the rear axle differential are armoured with various aluminium plates. All this together gives the pick-up from Volkswagen, which is already an all-terrain vehicle, even more offroad competence and makes it even more fun for the driver. 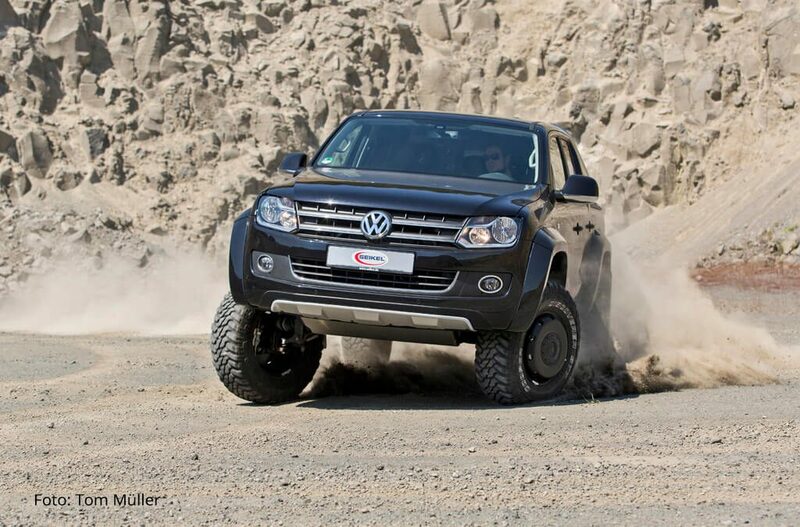 The Amarok Extreme is a reference for what makes SEIKEL fun: to equip everyday Volkswagen vehicles to such a high standard that they become the stuff of their owners’ dreams, not their nightmares.